I have just installed a new archival exhibit at the Kingsport Public Library. It celebrates the men and women who served our country during the first and second world wars and honors the people who supported them while they strived to maintain home and community. The left case features a wonderful panoramic photo of soldiers from the Great War in basic training and a pastel portrait of an American guard drawn by a German prisoner. I think I learned more from researching for this exhibit than I have from curating any previous one. I learned about what community organizations did to support the war effort and the vital role the Red Cross played. I learned about what things families went without by studying rationing guidelines. I read touching accounts of loss, capture, and patriotism. In fact, it was difficult to stop the reading and start writing and preparing. 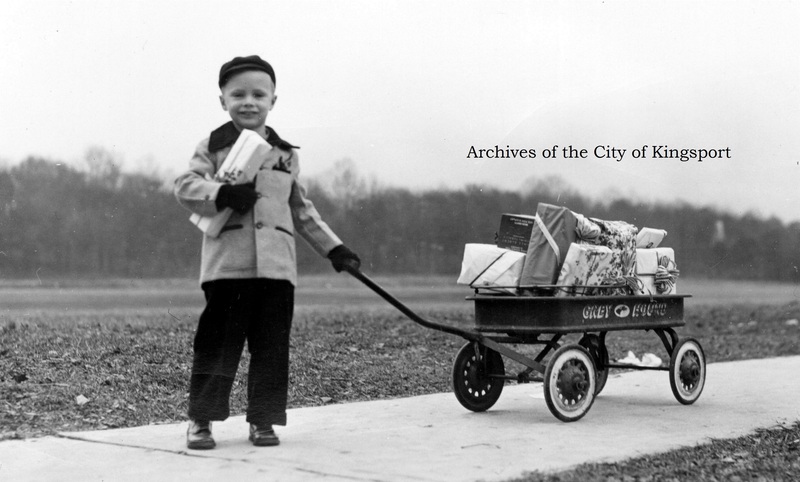 Little David Rankin delivering Christmas gifts for veterans hospitalized in the Legion Home, 1945. I learned about David Rankin whose father, Major Curtis Rankin , was killed 19 September 1944, while serving with the Seventh Armored Division in France. 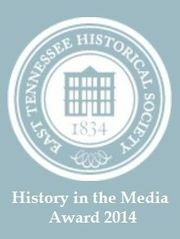 I also learned about Tennessee heroes like Clyde Mitchell, who guarded German SS prisoners after World War II ended and was revered for his fairness and humanity; Alvin C. York, whose efforts to shut down and capture German machine-gunners earned him the Congressional Medal of Honor and a place in Hollywood history; and hometown heroes like the employees of Tennessee Eastman and Holston Defense whose hard work earned them our country’s highest honor for excellence and allowed our forces to succeed on the battlefield. The right case showcases ration books for gas and commodities and features the story of The Erwin Nine, local air corpsman who all served significant time in and survived German prisoner of war camps. Front and back covers of ration books belonging to Mack and Ruby Moore. 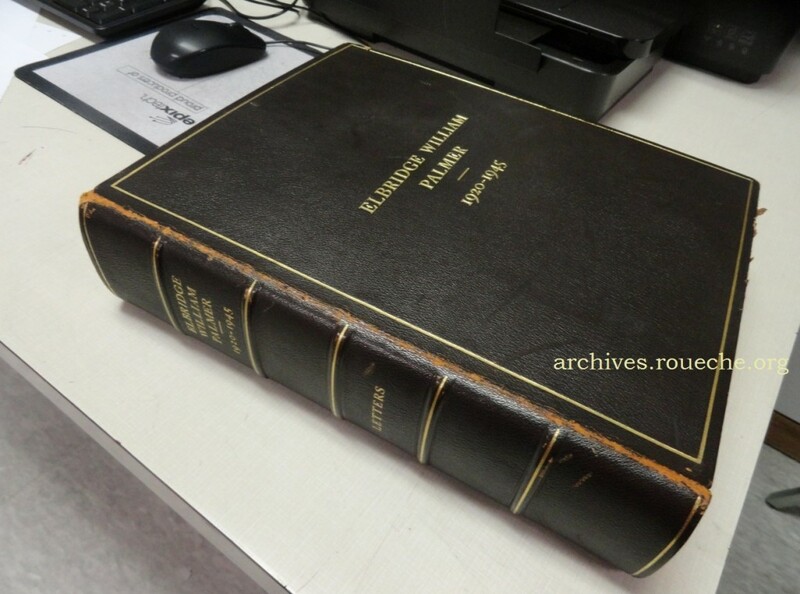 I think my favorite find was a scrapbook from the Palmer Family Collection. Elbridge Woodman Palmer was the president of the Kingsport Press for many years. He was an advocate for disabled children’s healthcare and, because of his passion for books and publication, the local history and genealogy room in the Kingsport Public Library is named The Palmer Room. E.W. and Lillian Palmer had two sons. One of them, Elbridge William Palmer, served in the US Army during World War II and died of wounds received on Okinawa on 28 April 1945. The scrapbook preserves every letter that Bill wrote home to his parents while at boarding school, at university, and in the service. What a treasure! His letters reveal a gracious, intelligent, humorous young man with tremendous love and respect for his parents. I scanned some of the correspondence from this book for the exhibit and share it with you, below, in the hopes that it will inspire you as it has me. 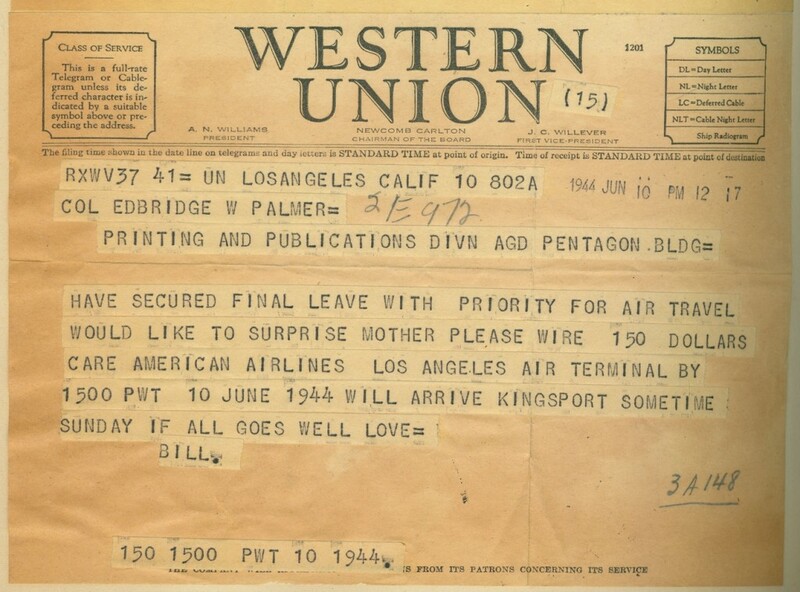 Bill sent this telegram to his father, Colonel Palmer, who was working at the Pentagon during the war, to secure his help in surprising his mother while he was on leave, June 1944. 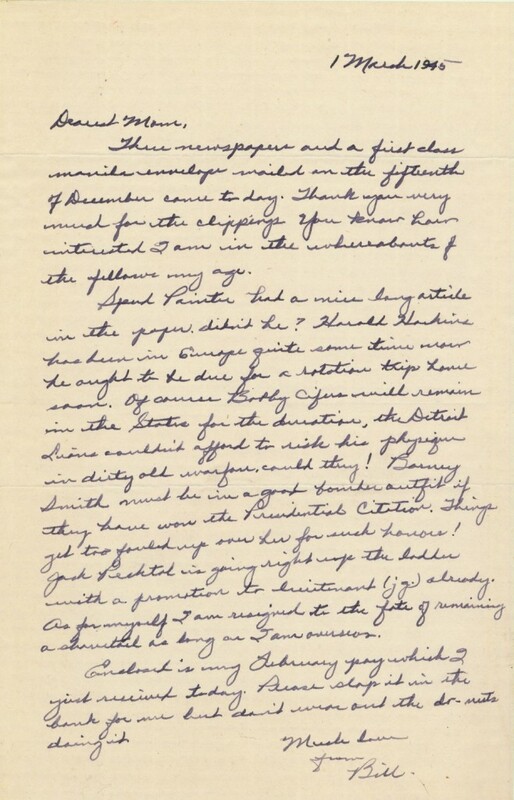 This letter to Lillian Palmer at home in Kingsport thanks her for sending newspaper clippings containing updates on his hometown friends, whom he lists by name; including Spud Painter, Barney Smith, and Bobby Cifers, Harold Harkins and Jack Pecktal. This V-mail dated 22 March 1945, is the last letter contained in the scrapbook. In it, Bill thanks his dad for gifts he had just received. On the right, the note of appreciation the Palmers sent upon receiving gifts and expressions of sympathy. This exhibit would not be possible without families, organizations, and individuals who carefully preserved their histories and thoughtfully donated their papers to the archives so that everyone might benefit from them. Items in the exhibit come from twelve different collections and I cannot possibly discuss them all in one blog post. Luckily, “Homefront” will be on display on the main floor of the Kingsport Public Library through February 14, 2015. This entry was posted in Kingsport and tagged Elbridge Palmer, exhibit, Kingsport, military, scrapbooks, World War I, World War II. Bookmark the permalink. Wonderfully researched and written, you may also find interesting the information contained in the book, ” A History of Saint Paul’s Episcopal Church, 1929-1970″ written by Max Y. Parker. Commencing on page 111 is the report of Service of Dedication of a large stained glass window given by Col. and Mrs. E W Palmer in memory their son and others in WWll. The date of the service was October 5, 1947. 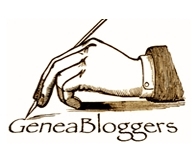 Please keep up your most interesting writing. Great display! 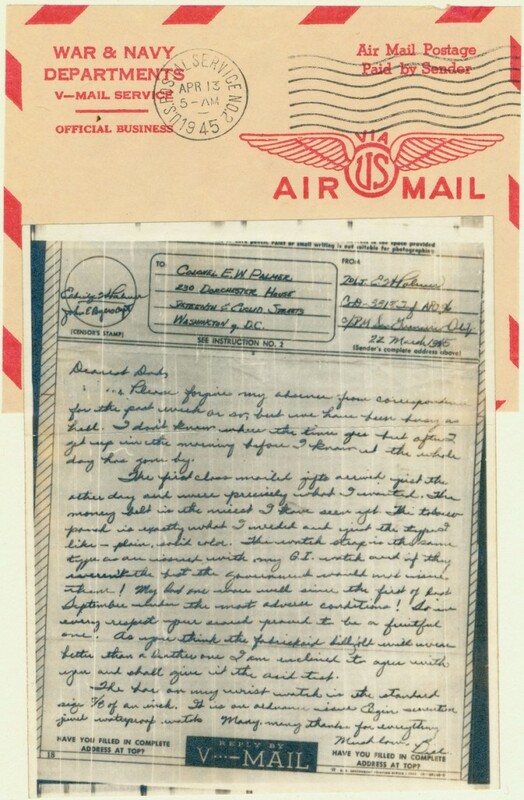 My cousin has letters my great uncle wrote from World War II home to family. I am trying to get her to donate them to the archives. They reveal so much personal war history that you would never find in a history book. To be noted that the Palmer’s other son was the famous John Palmer who became NBC’s White House correspondent, later of the Today Show. Journalist John Spencer Palmer’s father was Eastman Chemical Company executive Spencer E. Palmer. E.W. and Lillian Palmer’s oldest son was Weymouth Woodman Palmer (1913-1992). On 22 September 1945, Weymouth named his first son Elbridge William Palmer II, born just months after Lt. Elbridge “Bill” Palmer was killed in May of 1945. First thing I did when I got to work this morning was check out the display. I think this one is my new favorite. Thank you for all the time and effort you put into the display.